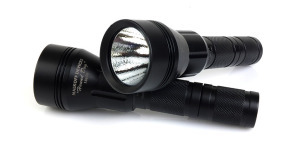 Over the years since its introduction, the Malkoff Devices MD2 has firmly established itself among the favorites of flashlight enthusiasts and those who demand the most from their illumination tools. Designed to accept Malkoff drop-in LED modules, the MD2 can be purchased as a host (with no LED drop-in module) or as a complete “turn-key” flashlight with a M61 drop-in already installed. The latest version of this drop-in, featuring a Cree XP-G2 emitter, is rated to produce more than 300 lumens of output for approximately 1.5 hours when used with lithium 123A primary batteries. Current pricing for the MD2 is $63.00 for the host only, $99.00 for the turn-key version with M61, and $119.00 for the turn-key version with M61 and High/Low Bezel Switch. Numerous other drop-in modules and accessories are available for purchase separately. This review will focus mainly on the turn-key MD2 when equipped with the M61 drop-in module and High/Low Bezel switch. Solid is probably the best word to describe the Malkoff MD2. Whether talking about the body, the head, or the M61 drop-in housed inside, every piece of the MD2 has a substantial feel and is obviously built to last. Made of 6061 T6 Structural Aircraft Grade Aluminum, the MD2 features exterior Type III anodizing and interior Chemfilm coating for durability and corrosion protection. Currently available only in black, the MD2 has also been produced with other finishes, including Camouflage and Pink. Conspicuously absent of logos or flashy design elements, markings on the MD2 are kept to a minimum with only the manufacturer’s name, model, and “Made In USA” laser engraved on one side of the body and the serial number on the opposite side. With a 1″ diameter body, the MD2 is compatible with most mounting accessories and holsters used with tactical lights. Both the body and tailcap feature knurling and several ridges to enhance grip. The Cree XP-G2 emitter is protected by a scratch and shatter resistant hardcoated acrylic lens which is designed to allow 95% of available light to pass through. The M61’s output is focused by a custom orange peel reflector, designed by Don McLeish, to produce a beam that is balanced between throw and spill. A gasket is used to provide a weather tight seal between the lens and bezel. Switching is handled at the other end of the MD2 by a McClicky tailcap switch. This forward-clicky style switch allows momentary operation with a partial press and constant-on operation with a full press and click of the switch. Actuation is smooth and positive with an audible click when latching into constant-on mode. A raised edge around the tailcap allows the MD2 to tailstand on a flat surface and helps reduce the possibility of accidental activation. The rubber boot and the switch itself are user replaceable. Both the head and tailcap of the MD2 are removable and batteries may be loaded from either end. Shock isolation for the batteries is provided by springs at both ends and O-rings are used to maintain a weather tight seal. The battery compartment measures 18.7mm in diameter to accommodate most 18650 lithium-ion rechargeable batteries. The head can also be disassembled allowing easy replacement or upgrade of any component. Housing the fully potted electronics, the M61’s solid brass heatsink provides an effective thermal path to draw heat away from the LED itself. With an input voltage range of 3.4 to 9 volts, the M61 drop-in can be operated with nearly any battery combination that will fit inside the MD2 body, including lithium primary 123A cells as well as 16340 and 18650 lithium-ion rechargeable batteries. When purchased as part of the turn-key package, the MD2 comes equipped with two Battery Station 123A lithium primary batteries. In its basic configuration the MD2 has only one output level. However with the addition of the High/Low Bezel Switch, users have a choice between full output with the head fully tightened or low output with the head loosened a fraction of a turn. The brass High/Low Bezel Switch is completely housed inside the head of the MD2 and replaces the usual aluminum lamp retaining ring. The High/Low Bezel Switch utilizes a resistor to produce the lower output level. As a result, the low level output may vary depending upon the type of battery used. 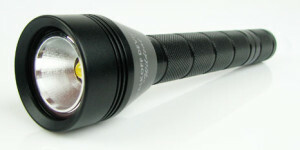 For many users, myself included, the Malkoff MD2 with M61 drop-in is one of the standards other lights are compared to. When equipped with the M61 drop-in, the MD2 produces what I would consider to be a general purpose beam, which is good for a wide variety of tasks. The overall beam is very white with a slightly cool tint and a noticeable center hot spot. Moving outward from the center the beam transitions smoothly into the spill beam which is very clean and even. Although it is capable of reaching much further, the beam is seems ideally suited for illuminating objects out to 150-200 feet. The following slides show the MD2 with M61 drop-in compared to a variety of other lights to give some perspective with regard to output and beam profile. The images can be compared across their full widths using the slider and additional comparisons can be viewed by using the navigation buttons in the bottom-right corner of each image. When operated continuously in high mode, the head of the MD2 gets warm but not overly hot, reaching a maximum temperature of 110 degrees Fahrenheit (72 degree ambient). With all battery types, output is stable the entire time the light is running in regulation. When powered by two SureFire 123A Lithium Primary batteries, the MD2 produced its full output for just over 90 minutes and then began a long taper as the batteries were depleted. In this configuration, the MD2 was still producing a usable amount of light when the test was ended after 3 hours of runtime. The K2 Energy LFP123 Lithium Phosphate rechargeable batteries powered the MD2 for 45 minutes at full output before beginning a rapid decline. When the test was ended at 52 minutes, the MD2 was still producing 4 or 5 lumens of output. With two AW 16340 (RCR123) Lithium-Ion rechargeable batteries, the MD2 produced its highest output, approximately 7% more than with 123A lithium primary batteries. This output was sustained for just over 52 minutes until the batteries’ own protection circuit kicked in to prevent over discharge. I recommend only using protected lithium-ion rechargeable batteries in this configuration. Using a single AW 18650 (3100mAh) Lithium-Ion rechargeable battery resulted in a slightly lower output than the other battery options but gave the longest total runtime. Producing about 3-5% less output than with 123A lithium primary batteries, the MD2 with AW 18650 maintained regulation for just over 70 minutes before beginning an extremely long taper as the battery was depleted. Output was around 100 lumens after 4 hours of total runtime and approximately 30 lumens after 6 hours, when the test was ended. 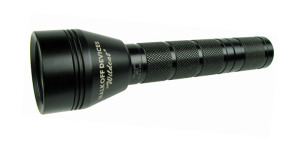 The Malkoff MD2 is a solid, dependable flashlight that is built to last, even under hard use. In addition, the modular design and parts compatibility with other Malkoff products ensure the MD2 will never become obsolete as it can be easily upgraded as newer drop-in modules become available. 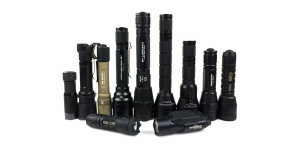 Even now there are over a dozen drop-in options in a variety of beam tints and ranging from less than 100 lumens to nearly 400 lumens maximum output. Users wanting even more powerful options can choose a longer body, the MD3 or MD4, and utilize the more powerful M91 series of drop-ins with up to 825 lumens of output. When outfitted with the M61 drop-in the MD2 is a terrific short to medium distance light which is able to evenly illuminate a fairly broad area. Due to its low current draw and solid regulation the MD2/M61 combination can also be counted upon to provide a consistent and predictable amount of light over the majority of a battery’s life. Compatibility with a variety of battery types also means that users can tailor their battery choices based upon their needs and usage. The addition of the High/Low bezel ring provides a simple method of switching between full output and a lower mode by simply tightening or loosening the head. Even when using the MD2 with one hand, the action is smooth and easy to operate. To put it simply, the Malkoff MD2 provides a combination of reliability, durability, and versatility that sets it apart from the competition. Good runtime with long taper as batteries become depleted (with primary batteries and 18650 Li-Ion). Perfectly round design prone to rolling away if left laying on its side. Finally, no review of a Malkoff Devices product would be complete without mentioning the great service and support provided by Gene and Cathy Malkoff. Both are well known for their desire to satisfy customers and are quick to answer any questions or provide assistance. Cathy is also familiar to many for her handwritten “Thank You” note on the invoice accompanying each order. It’s personal touches like these are reminders that you are dealing with real people with a genuine interest in their customers. Additional information about the Malkoff MD2 can be found on the Malkoff website. Malkoff, it is serious stuff and i am satisfied. They certainly are. Thank you sir for visiting! Keep up the good work. Your reviews are some of the most thorough reviews available with outdoor beam shots and output percentages across run times. These Malkoff reviews explain my affection for his products, 100 percent output for the whole run time, no 75 percent outputs shown here. Nice! Where did you get the UCL? On the flashlightlens.com Web site. I bought the size 22.61mm x 1.85mm which adapts itself perfectly on the model M61. That’s good information Dan. Thank you for sharing! why do the Malkoff dropins have such a small reflector diameter? This is only a guess on my part but maybe it’s because their original drop-in used an optic instead of a reflector. Since then the outer portion of the drop-in has remained the same even though they are now using reflectors. Whatever the reason is, I’m sure Gene Malkoff will tell you if you ask. is the 18650 Li-Ion rechargeable cell being used in this review a non-protected Li-Ion rechargeable cell or what is causing the tapper? For reference: In the M91B drop-in review theres no tapper using two (2) 18650 Li-Ion rechargeables cells. Nevertheless it is unclear as of this point wheather this is caused by A) doubing the number of 18650 Li-Ion rechargeable cell, (B) due to protected 18650 Li-Ion rechargeable cells being used in that review, or (C) an unique characteristic of the M91B drop -in module. Protected AW 18650 cells were used in both sets of tests, a single 3100mAh cell for the MD2 with M61 and a pair of 3400mAh cells for the M91B. The reason the M61 in this review has such a long tapering output is because the drop-in is designed to run all the way down to 3.4 volts (and below). As a result, when the M61 is powered by a single lithium-ion battery, it can pretty much run until the battery’s own protection circuit trips due to low voltage. This behavior is typical for many lights powered by a single lithium-ion battery. The M91B has a operating range of 5.5 to 12 volts which means it cannot be powered by a single lithium-ion battery. In its case, the combined voltage of the two batteries remains high enough for the drop-in to provide its (almost) full level output for the entire time. The test in that review ended when the overdischarge (low voltage) protection circuit activated in one of the protected batteries. The M61 will behave the same way when powered by two lithium-ion batteries, just with a lower level of output (compared to the M91B) and considerably longer runtime. thank you very much for explaining what is causing the tapper and how to counter it! How is the runtime affected, if an up to 12 volts plug in like the M91B is supported by an third 18650 Li-Ion cell? And are you by any chance going to review the M61SHO drop-in in a MD4 body too? Hi Thomas. Theoretically adding a third 18650 would provide 50% more runtime than two cells. I haven’t tested this very much but I would expect the actual result to be just a little bit less than a 50% gain. This is because there will be more energy wasted as heat as the drop-in bucks the voltage down to a usable level. I have been meaning to test this with a few drop-ins but, at the moment, I only have two 3400mAh 18650 cells. I plan to review the M61SHO one of these days, in fact, I would like to do a full round-up/comparison of all of the M61 drop-ins. I’m hoping to get started on that project early in the coming year. thank you very much for sharing your knowledge once more. I hope that Malkoff Devices is going to release a MD6 body so one can use a 3x 18650 Li-Ion rechargeable setup directly without the neccesarity of any third party extension. I assume that especially the designed “up to 12volts plug-ins” (M91B, M91BW, M61SHO) would benefit from it. And it would keep the apparently great production quality of the Malkoff bodies without intoducing an weak link (third party extension) into it. Maybe that even resolves the long tappering issue of the Wildcat V5, if the combined voltage of 3x 18650 Li-Ion rechargeable batteries would affect the Wildcat V5 as 2x 18650 Li-Ion rechargeable batteries affect MD2 head with M61 plug-in and MD4 body (compared to 1x 18650 Li-Ion rechargeable batteries MD2 head with MD61 plug-in and MD2 body; long tappering). What is those useable voltage level (reffering to your “as drop-in bucks the voltage down to an usable level” sentence)? And what does it give/take Li-Ion rechargeable battery wise (e.g. EagleTac 18650 Li-Ion 3.400mAh green-white rechargeable batteries seem to be of popular choice)? And an plug-in comparision would indeed be great! The proper voltage needed for a light to operate at its full potential is referred to as its forward voltage and varies depending upon the type of LED you are using and how hard it is driven. For LEDs like the XP-G2, XM-L2, and XP-L this typically runs in a range from around 2.8 to 3.4 volts. Since this is lower than what is provided by even a single lithium-ion battery, the electronics (the driver) in the flashlight regulate the voltage and/or current to avoid damaging the LED. do I understand you correctly, that the ‘forward voltage’ is supposed to match the battieries’ voltage, if one wants to operate a light at its full potential (which is not the case with MD2 head/MD4 body in conjunction with M91B plug-in, but controlled by the electronics (= the driver) of the flashlight)? I do not understand why the named plug-ins is listed as to run with 5.5+ volts and actually run better in this setup, if this holds true. Do you think the long tapper of the Wildcat V5 is going to be resolved by using an third 18650 Li-Ion rechargeable battery? And would a MD2 body work to extend a MD4 body to run 3x 18650 Li-Ion rechargeable batteries? I’m learning with every reply from you, thank you very much. With the Malkoff drop-ins, the driver is designed to step the battery’s voltage down, as necessary, to match the LED. The voltage range assigned to the various drop-ins is a function of that driver rather than the LED itself. For most of the Malkoff drop-ins, once that lower voltage limit is reached (as the battery is depleted) the electronics no longer function and the battery pretty much powers the LED directly. With a single protected lithium-ion battery, this means that drop-ins like the M61 will continue to produce ever decreasing levels of light until the protection circuit in the battery is activated. The exact point this occurs will vary by battery brand/type/size but for the AW cells I used in the tests it is around 2.5 volts. When two lithium-ion batteries are used in series, such as 2x18650s in the MD4 body, the voltage is doubled. This means that when using protected cells, the internal battery protection circuitry will usually be activated about the same time (for the M91B) or before (for the M61) the minimum driver voltage is reached (2 x 2.5 volts = 5 volts). This is why the multiple cell configurations usually run until they abruptly shut off with little or no warning. The Wildcat V5 creates a bit of a different situation as it uses the Cree MT-G2 emitter with a forward voltage of 6 volts and has a driver designed to operate down to 6.5V. With a third 18650, the voltage would remain higher and I would expect it to remain relatively flat until the protection circuit activated in one of the batteries. However I haven’t tested this myself so I have no way of knowing for sure how it would behave. Malkoff bodies cannot be used to extend other Malkoff bodies. The bodies have a larger diameter at the head and have only external male threading. 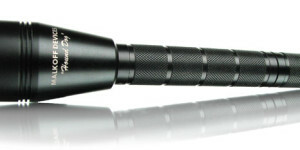 i have one of these lights and would be interested in seeing how it compares to the Malkoff MDC XP-L 2CR123 flashlight. 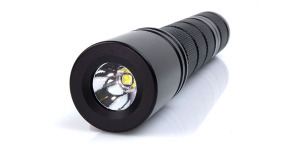 I haven’t seen a review on your site for this flashlight?